Long-time readers will remember when Don built the awning off the barn two years ago. Then last year he built feed boxes under the awning. Both additions to the barn have proved highly successful and have contributed greatly to the comfort of the animals, especially in winter. But we hadn't addressed one side-effect: the accumulation of waste under the awning. ...to the point where it was pushing out the bottom board of the feedlot fence. Here's the view from inside the feedlot. The fence being pushed outward is on the right. One of the projects Don wanted to accomplish before winter hit was to clean out under the awning. But he was stymied by the mechanics of getting the tractor positioned correctly to scoop out the manure most efficiently. "If only I could come in from the side," he mused. So that's exactly what he did. He realized if he removed the side fence from under the awning and replaced it with a gate, it would allow him to use the tractor and remove the manure easily. 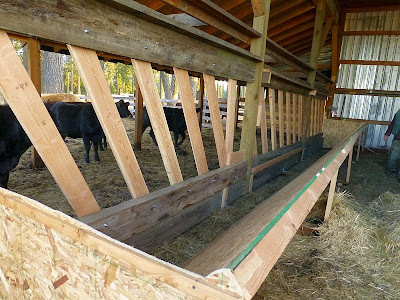 We didn't realize it until later, but this arrangement will also make it far easier to load or unload livestock, since the outward-swinging gate will make a sort of chute. First thing he did was buy a tube gate (it's on top the wood rack on our pickup truck). Next he removed the side fence under the awning. I thought this bottom board was cracked under the pressure of the built-up waste, but I was wrong; it was merely very warped. Don used the fork tines on the tractor to lift it out. Naturally the chickens took advantage of the situation. With the obstacles out of the way, Don wondered how hard it would be to remove the compacted manure, so he took an experimental scoop -- and found it was easy as pie. He was tickled pink and couldn't wait to finish the job. But since he couldn't start until the next day, he hung the gate instead so we could let the animals back into the feedlot. ...and he opened the gate and began scooping. He couldn't believe how easy it was (this man loves his tractor!). He dumped all the waste in the spot we use for dumping barn compost. It's mostly empty at the moment since a neighbor took most of it in the spring for his garden, so we had plenty of room for a fresh pile. ...and the chickens grew happier. In the end, the waste pile was enormous. We couldn't be happier with this stuff. Since it hardly has any hay mixed in, it will compost rapidly. By spring we'll have several hundred pounds of beautiful compost to add to the garden. After some hand-work cleaning out corners and edges, this is what it looked like under the awning -- a vast improvement. It also cleared out this little postern gate. When Don first installed it while building the awning, he accidentally put the hinges on the wrong side, meaning the gate would only open into the awning instead of into the barn. Naturally the manure buildup under the awning blocked the gate. He took this opportunity to remove the hinges and put them on the other side, which allowed the gate to open inward under the barn. Now that the new tube gate is in place, it will be far easier for Don to use the tractor to clean out the awning during the winter, preventing this kind of buildup in the first place. Just one more step on the road to homestead efficiency. I love reading about your ranch and life. Thanks so much for taking the time to write and share pictures. You have taught us so much over the years! I had a hard time reading this article because my three year old son liked the tractor pictures and would scroll my phone up when I got to the chicken pics. "Naturally the chickens took advantage of the situation." They're better than Physicians Mutual, They're there when you need them! That Don! He comes through again. I know exactly how Don feels about the tractor. I would far rather give up the car than the tractor because it is so useful. I use it so much daily and without it I'd be lost and certainly wouldn't be able to handle everything physically without it. Love those tractors! Patrice, my wife and i are avid homesteaders and preppers near Fort Worth Tx. And we follow your blog every day. We have goats, donkeys, rabbits, pigs, chickens, and gardens. As part of our gardening, we compost a lot of used hay and manure along with anything else that the animals dont eat. We buy local hay same as you. I recently became aware of "killer compost". I followed up on this and was shocked to learn of the accidental/unintentional side effects of Grazon (picloram) and other similar products in the hay and manure and how it destroys garden soil for YEARS. Grazon is a selective herbicide. Unfortunately, vegetables get selected! We seemed to have a decent garden the first year we tried. But ever since, there seems to be an increasing, unexplained ill effect on some of the garden plants that we try to grow in the plot where i till in the compost. Last year we got only a handful of beans and the peas did nothing. This along with dismal yields of the other vegetables. Corn was ok.
Learning about the "killer compost" tied it all together. I spoke with my dad about this and his garden. He uses grazon on his pastures but was completely unaware of the dangerous side effects. We got the label off a jug of it right then and there and read the "fine print" that says in black and white to NOT use manure from a grazon treated field or hay for ANYTHING. Who reads it? My opinion is that a bunch of us have been unwittingly poisoning our land for years by buying hay from treated fields. (the last time i checked bales of hay didnt come with warning labels). So, i want to know your experience and practices on the matter please. Yall seem like serious and consciencious homesteaders so i figure yall would know something about this. Feel free to share and print/rewrite this letter. Thank you for alerting me to this! I have no idea if Grazon is used in our area and will see what I can find out.